CRX553012RC rolling tool box features 12 drawers and full-extension ball bearing slides. "Love it. Just bought the black triple bank top and bottom it's a ton of storage for the buck everything seems to be high quality and just as good as Snap On and MAC." Our complete toolbox product line is made by Extreme Tools. Extreme's RX series toolboxes have been upgraded to our CRX series. All boxes with the CRX prefix are labeled RollCabs.com and follow the same warranty as Extreme Tools products. The CRX series (improved features) comes in 55” and 72” sizes with the Rollcabs.com label include heavy duty 150 pound ball bearing drawer glides. On all CRX series drawers 4” high or more, where two ball bearing glides are used, the load capacity is 300 pounds. CRX series roll cabinets include new, thick protective work panel in place of foam pad. All CRX toolboxes are not only reduced in price but have added benefits compared to the RX Series Extreme Tools' tool boxes! I'm very happy with my toolbox, I already referred you another sale of a box like mine. Very pleased with the purchase and service. I'm not one to write reviews but my experience at NHProEquip was exceptional. I cannot recommend Clark and his company enough. I wanted a professional-grade rolling tool box and began an extensive search online for the best value available. Not only are Clark's prices the lowest around, but the service was extraordinary. I called him, got valuable advice, and easily placed my order. I live in a densely populated urban area with narrow access to my garage, so I knew delivery was going to have its challenges. Without even being prompted, Clark took the initiative to figure out the best solution to ensure a seamless delivery process (including considerable investment of his own time to make it happen). You can go to a nameless eCommerce storefront and pay the exact same price with uncertain service, or you can call Clark and make sure the job is done right. I seldom have such a positive customer experience...anywhere. And of course the tool box is incredible. Thanks Clark! Just unboxed my new toolbox! Extreme Tools. Wow it is so nice I wasn’t sure what to expect since I’ve never seen anyone with this brand. But if your in the market for a new box this is 3x the box for the money compared to anything else. Very impressed. They are very close to and in some ways they are rated better than Snap On. And 1/4 the price. They have the best prices trust me I researched for about a month. And free shipping!!! Quality box every bit as good as name brand. Guy from my shop is gonna order a black one. I got the blue. Shipped in wood hard to damage that. I dig it man, thanks for hooking it up. It is a good investment for the money. Well built. I would recommend it to my friends. I absolutely love it. I had a snapon box that I sold after leaving the industry after 10 years for a different field. 7 years later I decided to go back in the field and was tool box shopping. I really didn't want to spend 10-15k on a large box again so I took a chance on this Extreme toolbox and have not been disappointed. Quality is every bit as good as the snapon I once had. The big name tool dealers that come in the shop all comment on how nice it is and can't believe what it cost. Tool box is awesome. Last night I was looking at the lockers for my toolbox. I'll be purchasing them in the near future. I really appreciate all the care and help you provided. Top notch service and quality product. The toolbox is working out perfect. I definitely believe I got my money's worth. VERY WELL. LIKE IT ALL!!!!!!!!!!!!!!! This box is awesome, it is huge, tons of space and drawers open and close very smooth, also customer service is tops. Very happy with purchase-- going to add side lockers in the future. Everything is fine. I'm happy with how it's been holding up. Love the size and durability of the box. As soon as I clean the van I’ll take some pictures of it, now three years later. Have hundreds of pounds in each drawer and 100,000 miles on the van. Still work as good as the day I got it. Sometimes on a sharp corner a drawer will open in slam but this box is built so well I have had no problems. I have had other boxes in other vehicles in three years is usually there a limit but this one is still like the day I bought it. Working out nicely thank you! Working out great. I have showed it to several people and told them where to get one. I am happy with my purchase so far. Quality and function are good and both boxes have met my needs. This by far is the best service I have received, the truck driver said all shipped items should be packed this way!, The crx7225rc is great! Love it. Great box from a great company. Just need an upper box and it will be the perfect combo. Just wanted to let y’all know my tool chest arrived today. Everything was just fine. It now seems to be the envy of the shop. This 55" 8 Drawer Top Chest measures 55" W x 25" D x 22.25" H and features quick release self-latching drawer pulls. Extreme Tools' 19" 3 Drawer Side Locker features 2 shelves and full extension ball bearing glides. 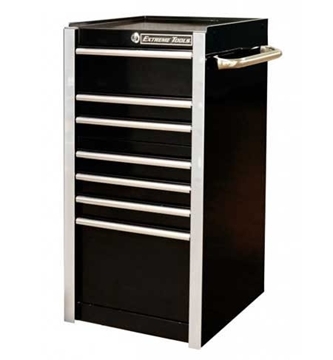 Extreme Tools RX192507SB 19" 7 Drawer Side Box features drawers with double slides.